Doesn’t it take courage to stand by your convictions wholeheartedly? Real Christians believe wholeheartedly that the Bible is 100% true and that it is the Word of God. In the Old Testament it states that marriage is meant to be between a man and a woman. Genesis 2:24 (NIV1984) For this reason a man will leave his father and mother and be united to his wife, and they will become one flesh. New Testament states this too: 1 Corinthians 7:2(NIV1984) But since there is so much immorality, each man should have his own wife and each woman her own husband. I am just stating that I believe the Holy Bible to be 100% true. I accept every word written in it, I do not just choose the parts that appeal to me. If this makes me narrow-minded, old-fashioned, and a bigot I guess I am. But this is a belief I am willing to die for. I wonder if everyone calling me (and other Christians) these names is just as willing to die for their belief. I was once told by someone that if I could not tell them their way of thinking was ok, I could not be part of their life. This really saddened me, because in order for me to be part of their life they wanted me to give up what I believed. I understand that not everyone thinks as I do, I understand that not everyone has my same beliefs. This does not mean I “hold blindly and intolerantly to a particular creed or opinion” (the definition of a bigot). This means I have courage of convictions. My not straying from that belief doesn’t make me a bigot, it makes me courageous. I stand by what I believe. In a sauce pan cook dried fruit, butter, sugar and tea over med-high heat. Bring to a boil and then simmer for 20 minutes. Stir in egg and flour. Pour into a greased 1 lb. loaf pan. This is a super easy recipe; however, I almost made it into a great big disaster. Friday I came down with my annual Christmas cold and it has settled itself in my head, making everything cloudy. Anyways, when I added the butter I cut one cube in half making it only ¼ c. of butter. I caught my mistake after I simmered it for 20 minutes, so I just added the other ¼ C. to the boiled mixture which actually helped to cool it down quicker. Then my next big ut-oh was with the egg – I mixed everything together put it in the baking pan and set it in the oven to bake. I was cleaning up and thinking to myself, “Boy it’s strange that the recipe didn’t call for an egg”. Well, sure enough, I went back to the recipe and there it was -1 egg, beaten. So, I yanked that pan out of the oven and added the egg. Luckily, it had only been about 1 minute since I put it in, and all was fine. Divide bread into 3 stacked piles (7, 7, and 6). Cut each stack into 4 squares (just make a + in your stack). Arrange the small squares from your first stack in your pan, covering the bottom. Pit and slice open about 10 plums, then place cut side down on top of bread. Spread 1 C. of raisins over plums. Mix ½ C. sugar and 1 tsp. cinnamon and sprinkle over pan contents. Pour ½ C. butter over everything in the pan. Repeat all of the above steps 1 more time. Finally, press last stack of bread into pan. Sprinkle ½ C. sugar over bread. In a mixing bowl, beat all the eggs and then mix in all the cream. Let it all sit for about 30 minutes. Heat oven to 350*F, then bake for 70 minutes. When this is all finished it will look like a fancy bread pudding. Serve it warm with hard or light sauce, or vanilla ice cream. It is mmm-yummy. I know these recipes are nothing like the traditional ones, but they’re something most people WILL eat and they don’t take a month to make. You can make and eat these all in the same day, and you can tell yourself, you are having a little bit of Christmas past. 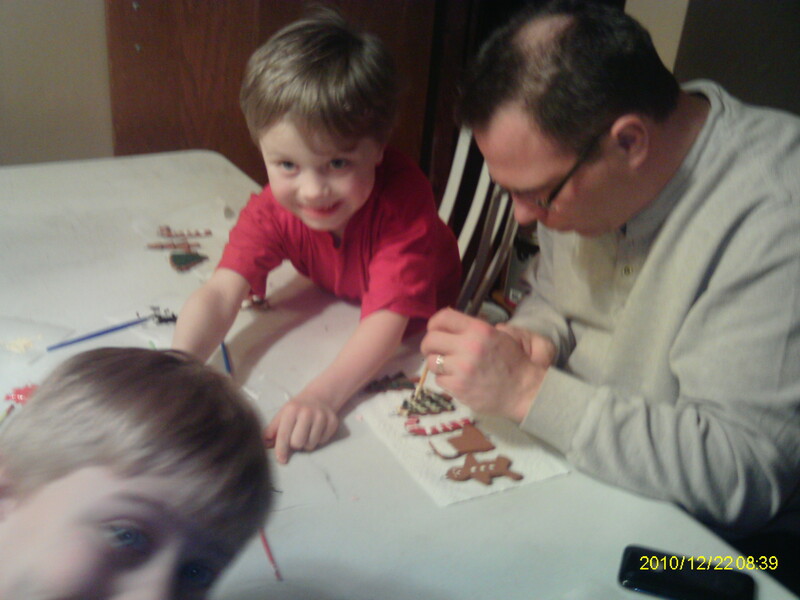 One of the activities on our 25 Days of Christmas list last year and again this year is Cinnamon Dough Ornaments. They are easy, inexpensive, and can be made into any shape. We also made these for Thanksgiving and really you could make them for any holiday. The Crazys made these ornaments in Kindergarten, and the first time they came home, I was in Heaven, because they smell so fantastic. Here are two recipes, you can choose which works best for you. Mix cinnamon, applesauce, and glue together in a bowl. The dough should be as thick as cookie dough. Add a bit of water if the dough is too stiff. Remove from bowl and knead. Put it back in the bowl, cover with plastic wrap, and let sit for at least a half hour. Remove the dough; knead again to make sure it’s smooth. Flatten/roll the dough between waxed paper until it’s between 1/4″ thick and 1/8″ thick. Cut out desired shapes; use a straw to punch a hole for the ribbon to hang. The circle of dough will pull out with the straw. Gently place the shapes on a piece of clean wax paper. They will take 3-5 days to dry, and you will need to turn them over a couple of times a day for them to dry evenly and flat. 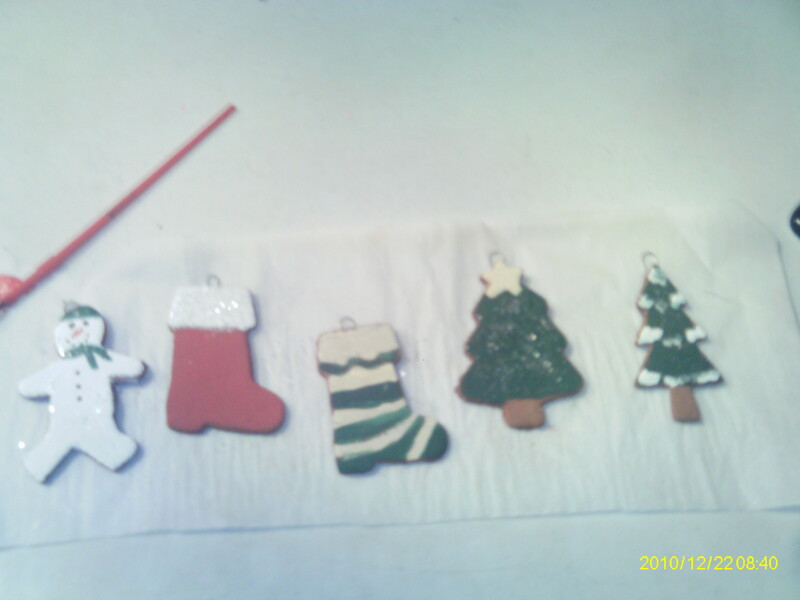 Use acrylic paints or fabric paints to paint details, like white ‘frosting’ on a gingerbread man or gingerbread house. Mix cinnamon, allspice, cloves, and nutmeg in a glass bowl or plastic bag. Add applesauce; mix well. The dough will be stiff. Roll to 1/4″ thickness on ungreased cookie sheet, marble slab or other flat surface. Cut into desired shapes with cookie cutters. Remove excess dough. Make holes for hanging ornaments with metal skewer or straw. Let dry, uncovered, at room temperature for 4 to 5 days. Remember how I told you I was a procrastinator? Well, when we made these for Thanksgiving I waited too long and didn’t have 3 to 5 days to wait for them to dry, so I put them in my food dehydrator and they were dry by the end of the day. These can be hung on the tree or on wreaths, attached to gifts, incorporate them into a center piece; whatever you decide to do your home will smell terrific. “While the cats away, the mice will play” is how the old idiom goes. My hubby, who had reached the point of no return in stir craziness, having been cooped up in the Little House for the last week and a half, sneaked away to visit a friend of his while I was at work yesterday. Although I was a bit nervous about his little venture in to the real world, I realized he wasn’t ready to leave the planet just yet and probably wouldn’t do anything too stupid, so with a huge prayer to the Lord above I wished him well and went to pick up the Crazys from school. A mere hour later the hubby called to let me know he was eating at his friend’s house. Once again, I wished him well and told him to make smart choices and informed the Crazys – “Its pizza night.” – there were hurrahs all around. “I don’t know,” I said, “but hopefully he will make good choices.” Then off to the pizza joint I headed. On the way there I started thinking about the layers of grease that would be floating atop my pizza, and my stomach started to turn. After weeks of happy heart eating would this pizza even taste good? Will it be too salty? Will the Crazys enjoy it as much as they think they’re going to? Suddenly, the soy sausage zucchini bake we were going to have for dinner sounded much better. Never-the-less, I continued on to the pizza joint. Walking in I realized the last time I had stepped foot into this joint had been two weeks ago, the night my hubby had his heart attack, now the cheesy goodness was seeming more and more like sat-fat filled cheesy not-so-goodness. This, however, did not stop me from ordering our regular. The vote was split, the two boy Crazys were completely pleased. The girl Crazy and me – not so much. To be honest, the sat-fats were definitely not agreeing with me, all the cheesy goodness wasn’t really all that good, and my slice of pizza felt like a brick in the pit of my stomach. I was truly missing the heart happy food of the last two weeks. After we finished our sat-fat filled artery clogging dinner, the hubby called and told me he had had a nice meal of salmon and salad – I was very jealous. I promised myself right then and there, from now on the Little House serves only heart friendly meals. After all, after only two weeks of healthy goodness my skin was glowing and I could pull my jeans down without unbuttoning them – Can you say shopping spree? Unit next time, enjoy your adventure. Many of you know my hubby suffered a heart attack a couple of weeks ago, and thanks to lots of prayer and great medical care he is doing well. He’s been home resting for about a week now, and he’s going a little stir crazy – he hooked up LOTS of speakers to just about anything he could, he arranged to have a new roof put on the Little House (thank Heavens we needed one), and he decided we needed cable TV so he could watch football. The new roof had me doing cartwheels, the speakers not so much, and football had me thinking – Football Food!!! The only problem was, having never really been a football watcher, I wasn’t really sure what football food was. I also had another problem, even though I wasn’t quite sure what football food was, I was pretty sure it was high in fat and salt – two ingredients that were now a no-no for my hubby. 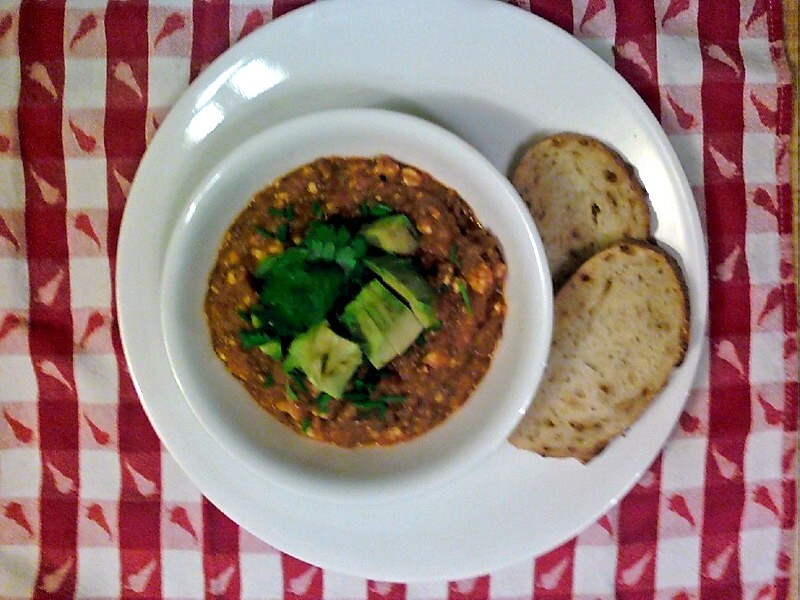 What I came up with was chili – Pumpkin Chili. If you’re going to make this fresh, you will need to start EARLY in the morning or a day before, because cooking the beans takes about 3 ½ hours at a minimum, roasting the pumpkin in an hour, and roasting the tomatoes and the veggies is another hour. Put dry red kidney beans in a pot with 3 C. water, bring to a boil and reduce heat. Simmer for 2 minutes; remove from heat, cover and let sit for 1 hour. Drain beans in a colander and rinse. Return beans to your pot with 3 cups of fresh water, bring to a boil, reduce heat, cover, and simmer for 2 ½ hours or until the beans are tender. If you hurry, you can still get sugar pumpkins. This is the girl Crazy at a local farm. 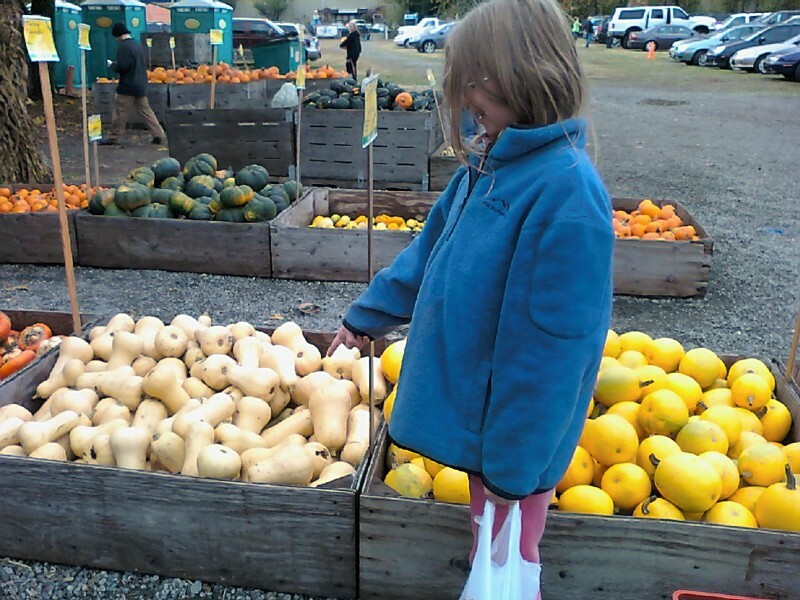 “No honey, that’s butternut squash not pumpkin” – crazy girl. Bring that sugar pumpkin home, wash it off, cut it in half, clean out all the guts, stick it on a rimmed baking pan with just a little water and roast at 400* for about an hour, when its done the skin pretty much just falls off. 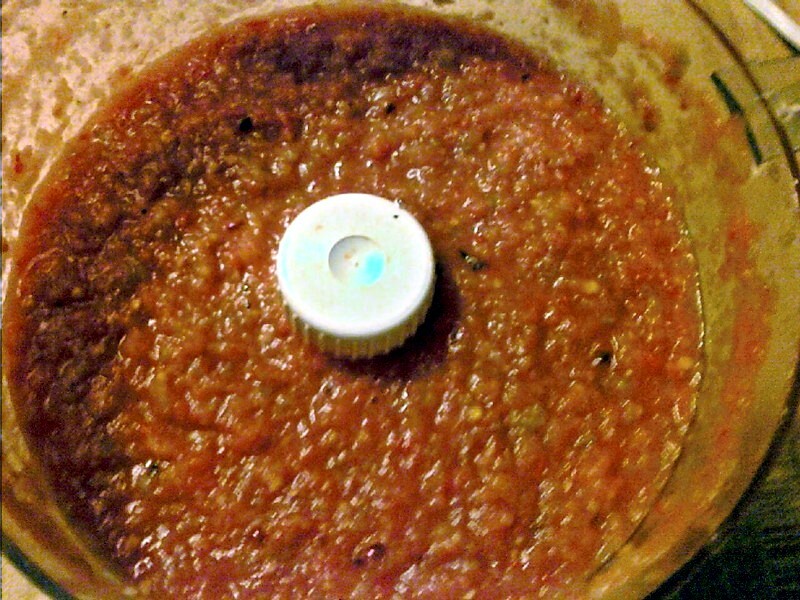 Take that yummy pumpkin meat; stick it in your food processor and puree. 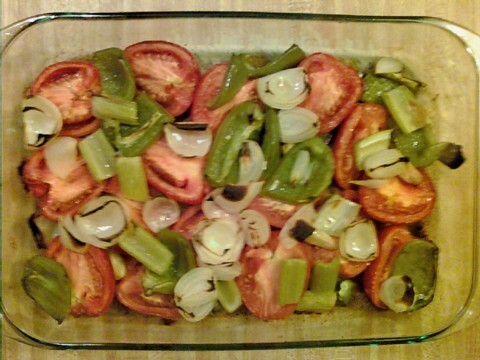 Next, you need to get those tomatoes and veggies into the oven. Reduce your heat to 350*, then slice 8 Roma tomatoes in half. Don’t worry about the skin and the seeds, just put it all in the baking dish– waste not want not. Core and seed one sweet bell pepper – use what ever color is your favorite (I used green). Cut it into large pieces and toss it into the pan. 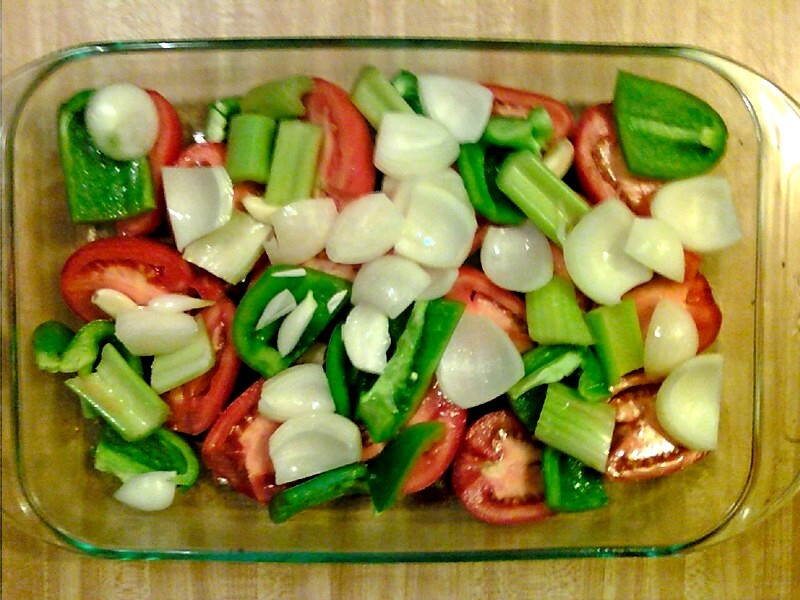 Also, toss in one medium onion peeled and cubed, one stalk of celery cut into about 2 inch pieces, and 4 garlic cloves. Spray it all with non-fat cooking spray and if you like sprinkle with salt (I skipped this part). Toss it all in the oven and bake for an hour. You’re almost done. 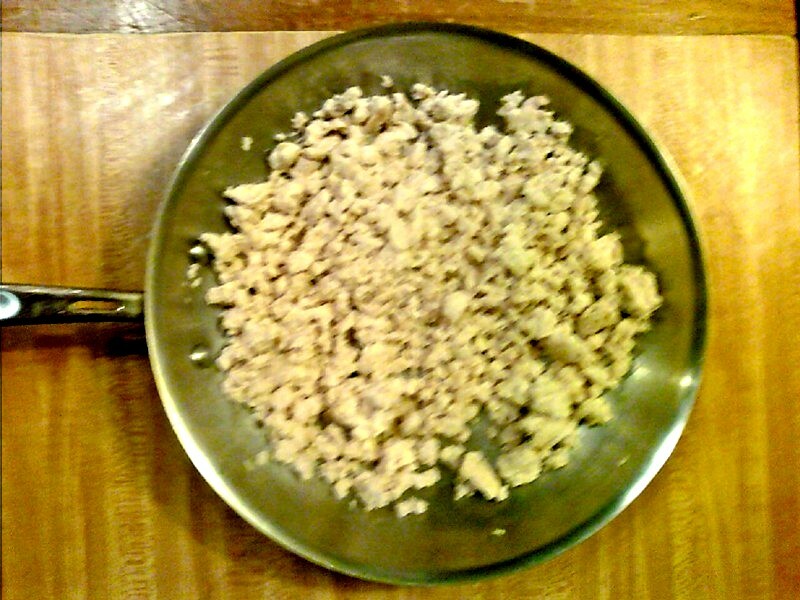 You now need to fry up some ground chicken breast. You can buy this already ground at the grocery store, or you can do what I do and buy boneless skinless chicken breast and grind them yourself. The benefit of doing this is you can buy nice healthy meat and you know nothing else has been ground up with it. 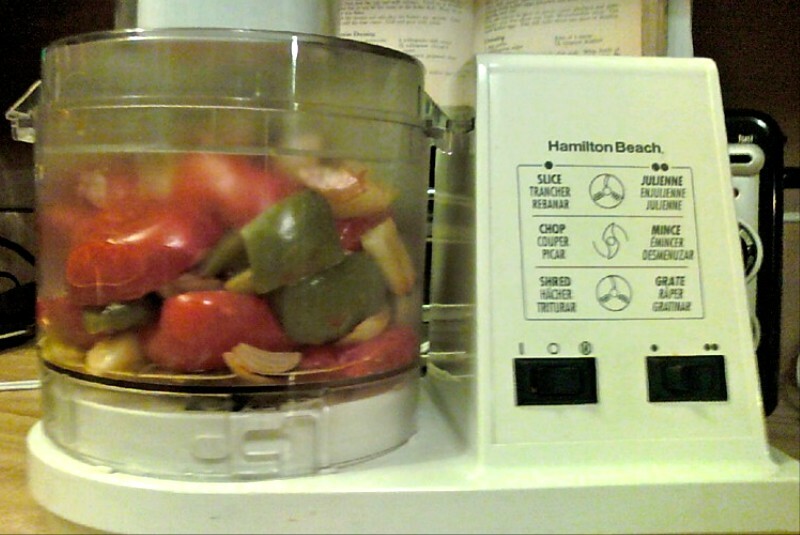 If you don’t own a meat grinder, fret not – head on back to that food processor, toss in your chicken breast, and puree. You now have ground chicken breast. Ok, we’re heading into the home stretch. Now you’re going to mix it all together with some spices (in the shopping list below), bring it to a boil, reduce heat and simmer for 20 minutes. When its all done you can either serve it with a little grated cheese and diced green onion (how I used to do it) or you can serve it the heart-healthy way with cilantro and dice avocado (my new way). I’m off now, its Monday and football is on tonight – I need another football meal.